The RV adapter will allow you to install any of the Sanicare Deluxe series and Italia Luxury series hand held bidets to your RV’s existing toilet. If your Toilet already has installed a “water saver”, this is a great upgrade for a much more stylish and durable sprayer. If your RV toilet does not have a “water saver”, it is a very convenient way to save water consumption, makes rinsing the bowl faster and easier. Most toilets today already have an adaptable vacuum breaker installed, simply check the back of your RV toilet for an extra port on the vacuum breaker as seen below on the Thetford Aqua-Magic V toilet. The RV adapter is designed to fit most Thetford toilets: Aria Classic, Style Plus, Style II, Style Lite, Bravura, Aqua-Magic: V, Galaxy, Starlite, and Aurora toilets (Provided they have the correct vacuum barker on each toilet). If your vacuum breaker does not have the water saver port, a replacement vacuum breaker can be purchased through you local RV parts and supply dealers. The RV adapter is designed to fit the most Domestic Traveler 510, Traveler lite 210, Revolution 310 toilets as well (Provided they have the correct vacuum barker on each toilet). If your vacuum breaker does not have the water saver port, a replacement vacuum breaker can be purchased through you local RV parts and supply dealers. 1. Turn off the water supply to the RV either the city water or the water pump. 2. Locate your toilet's vacuum breaker. Most will be located on the back of your toilet. 3. Disconnect the existing hand spray hose at the vacuum breaker. 4. 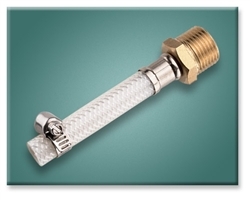 Install the supplied RV adapter with the supplied hose clamp. Note: The combination tee/valve will not be used. 5. Connect the hose to the RV adapter placing the rubber gasket between the nut and the adapter. Tighten well. 6. Connect the in-line control valve to the hose. Attach spray head to the in-line valve. Be sure to insert a rubber gasket in all threaded connections. In some cases, two gaskets will be required, depending on the connections. 7. Using the fastening set, install the holder at a convenient height within easy reach. 8. Turn on the water supply to the RV. 9. Test the rinsing spray to ensure there are no leaks.